There’s definitely no hiding the fact that I’m all ears, but I would like to think the statement is true in more than just the literal sense. I believe that being a good leader is all about being a good listener and each day I strive to become a more open, honest and approachable Vice-Chancellor. CQUniversity has embarked on a journey to become a great university and therefore I encourage absolutely everyone with any type of interest in CQUniversity, to let me know what is important to them, as we work towards achieving this vision. This is especially relevant with regards to our students. Students are the reason CQUniversity exists and in order to become a great university, catering for the needs of our students and meeting their expectations should be of paramount importance. 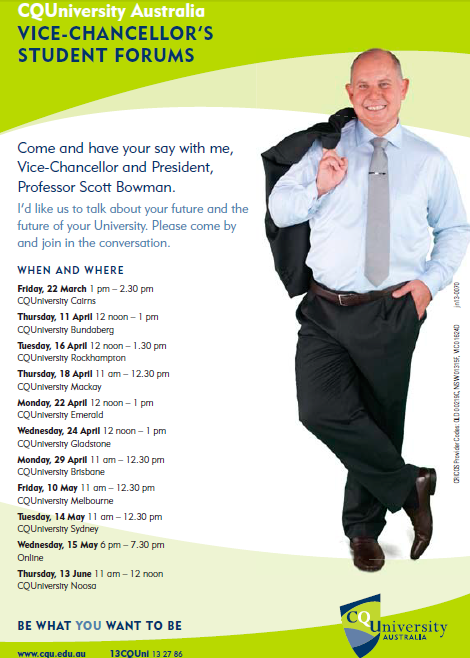 That is why this Friday (22 March) I will once again embark on a tour of all CQUniversity campuses for a series of Student Forums. The purpose of doing this is for me to get out and about, visit CQUniversity locations across the country, share latest CQUniversity news and listen to what our students have to say. An online forum will also be held for distance education students and those who couldn’t make it to the forum at their local campus. Forum dates are listed on the flyer below. More information and specific location details will be sent via email, to students, closer to the date of each forum. I really look forward to meeting as many of our students as possible at these forums but would also like to remind you all, that if you ever see me wondering around campus, to stop me and say g’day. CQUniversity is a part of the Regional Universities Network (RUN). For those of you who aren’t aware of what RUN is it is a network of universities (CQUniversity, University of Southern Queensland, Sunshine Coast University, Southern Cross University, University of New England and University of Ballarat) that are all headquartered in major regional areas of Australia. Combined these universities educate more than 110 000 students per year, with more than 40 per cent of these students are enrolled externally. The universities that make up this network share a common goal of providing first class higher education programs to communities based in regional areas, as well as to students who require the flexibility that distance education offers. These universities provide opportunities for people based in regional areas to access higher education where they otherwise might not have had the chance. Even though not often recognised, the impact of regional universities is immense and that is why last week the Chairman of RUN Professor David Battersby, launched a policy statement entitled Smarter Regions, Smarter Australia. This policy statement deals with unlocking the full human potential of regional Australia by providing greater opportunities for higher education in regional areas. As I always say, those who study local are more likely stay local after they graduate – meaning whole communities can benefit from the skills learned and the creation of new jobs. With two thirds of the nation’s economic assets and productivity located outside capital cities I don’t think I need to explain how important this concept is. Empowering regional universities will not only ensure greater access to higher education, but so to the social and economic sustainability of Australia in years to come. Along with future-proofing regional Australia and equipping communities with vital skills, regional universities also have an economic impact equal to the entire Australian clothing/textile and footwear industry or tourism generated by the Great Barrier Reef. To put it simply regional universities generate and contribute in excess of $2 billion per annum, directly to regional communities. Some of the statistics highlighted as part of this policy statement are staggering. I found it interesting, not just as a Vice-Chancellor of a regional university but as a resident of Australia. I thoroughly recommend reviewing policy statement– whether you live in in outback Australia or a high-rise in Melbourne’s CBD. I hope it will highlight just how instrumental regional universities are in contributing to the social and economic wellbeing of both regional Australia and our nation as a whole. I have just returned from the official launch of CQUniversity’s fully functioning ambulance vehicle, which is to be used here at the Rockhampton campus as part of our Paramedic Science degree. I am sure everybody would agree that paramedics do one of the most challenging and difficult, yet necessary jobs in our community, which is why paramedic science is such an important program to deliver. Training these future professionals is a good thing for everyone as unfortunately you can never be certain as to when you might be in a situation that requires their services. 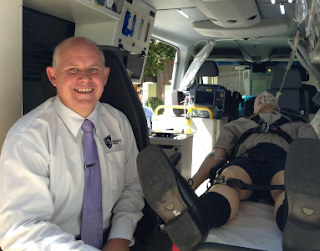 Resources like this ambulance are part of the reason why I am so proud to lead CQUniversity. Initiatives like this provide a real world insight for our students and greatly improve their overall study experience, preparing them for all the likely scenarios they will eventually face. The ambulance is exactly the same type of vehicle used by the Queensland Ambulance Service (QAS) and is to be used to familiarise students with the vehicle set up and equipment, as well as performing procedures in the back of a moving vehicle. CQUniversity’s investment in such quality technology will mean our students will be among some of the most prepared and skilled, upon graduating from their degree. Along with the ambulance our paramedic science students are also exposed to high-fidelity, state-of-the-art manikin systems and specialised trauma make-up techniques to that emulate severe trauma injuries. CQUniversity is also the only university in Australia offering the program by distance education, meaning students can study this all important discipline from anywhere in the country. In fact more than 75% of the students currently studying the program are distance students, based right across the nation from Torres Strait to Tasmania. What’s more, after only being established as a foundation program in 2011, 23 of our third year students have already been offered casual positions with the QAS - before they even graduate. This program will continue to go from strength to strength as we continue to invest in quality learning resources that cater for both on and off campus students. Should students be paid to study? That is the topic of our upcoming Rockhampton campus Great debate. I for one am particularly looking forward to adjudicating the action, as we have two lively teams made up of academics, managers and students go head-to-head. This is a fantastic event which adds vibrancy to the campus and brings everyone together through mostly light-hearted banter. I’m particularly interested to hear the arguments from each side of the debate, as I believe both have their merits. On one hand there is the argument that students shouldn’t be paid to study because graduates tend to have a greater earning potential in the workforce than many of the taxpayers who would pay their way. Then there is the alternative argument that students should be paid to study as it is difficult to maintain academic excellence while combining study with part-time or full-time work. 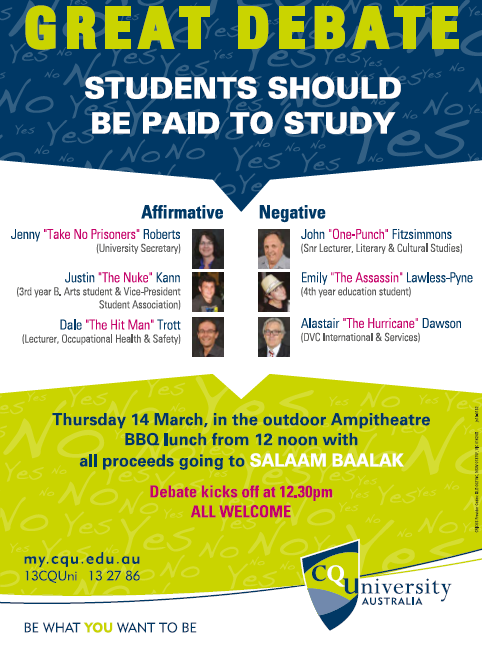 Whatever side of the debate you are on I certainly encourage anyone on the Rockhampton Campus this Thursday to come along and watch this lively and entertaining discussion as it takes place over lunch in the amphitheatre. 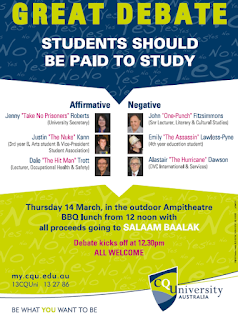 We will also be holding a fundraising BBQ on the day with proceeds going to the Salaam Baalak Trust in India (come along for a snag and stay for the debate!). In the past week CQUniversity further cemented itself as a national university, with the opening of the Appleton Institute Sleep Research Centre in Adelaide. The Centre is headed up by Professor Drew Dawson and is home to a team of 30 multidisciplinary researchers, who deliver leading sleep and fatigue research in relation to industry, sports and wider society. Along with the sleep lab there is also a rail and road simulation lab which is used for cognitive-behavioural and human factors research. The Centre also offers supervision for research higher degree students and psychology honours students. Most recently the Centre has also become home to a distance education study centre, providing a place for our distance education students in South Australia to access support and resources. In visiting the Centre last Tuesday it is clear to see how it provides a great atmosphere for postgraduate students seeking work, allowing them to be a part of a world-class team across areas including sleep and fatigue, applied psychology, human factors and OHS, exercise physiology, cultural anthropology, human-animal interaction and statistical analysis. I think Professor Drew Dawson hit the nail on the head when he said “We are building Adelaide’s best little university”. In the future I see this centre growing to become a boutique campus which offers both on-campus and distance education students an intimate, personal and supportive education experience. Last week we officially launched the first year Engineering program in Bundaberg. This launch comes after much campaigning by the local community to establish an engineering program in Bundaberg. In its foundation year the signs are extremely positive, with the program already attracting comparative numbers of students to the established programs in Mackay, Rockhampton and Gladstone. If this momentum keeps up I am confident we can further build on this program in the years to come. I think it’s great when regional universities can offer popular programs like engineering because it means kids can grow up, go to school and then go to university in their hometown. This benefits students as they have the opportunity of staying close to their support networks and living at home while they study. at the launch of Bundaberg Engineering Program. As I have also said many times before students who study local are also more likely to stay local, meaning the whole community will eventually benefit as these students apply their skills to local challenges. Good luck to all of our foundation engineering students in Bundaberg this year. I am sure with the support of your family and friends behind you will be able to achieve great things. Thank you also to the Bundaberg community including the local Council, high schools and industry groups who were all instrumental in allowing CQUniversity to get this program off the ground. 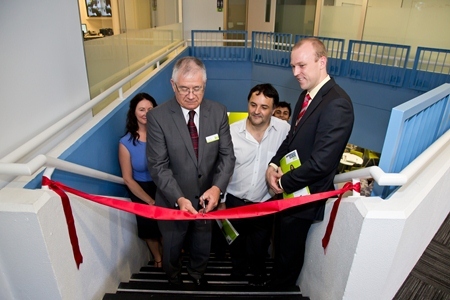 innovative engineering studio at the Bundaberg campus.